I awoke to a cloudy sky. Sunrise was snuffed out by a dense layer of clouds that spanned the horizon. I overheard a conversation between two hikers that morning. They hoped to begin a 3 day trek along the Paria River to Lee’s Ferry, but were concerned about the weather. The trip is unwise it there was a chance of heavy rain. To monitor the level of the river overnight, they placed stones along the bank to mark the water level. If the storm up north dropped a lot of rain, the Paria river would swell, making the hike hazardous at best. A check of the rocks showed that the river level hadn’t changed. They felt it was safe to begin their hike down canyon. I didn’t share the same confidence. The only way to be certain was to check the weather report at the local ranger station. It was still quite early, and the ranger station was closed. I parked nearby and ran my engine to charge the battery for my film cooling system. One by one, vehicles lined up at the locked gate. This is the same ranger station that conducts a daily lottery for permits to hike the wave. I’ve been there twice before, and wasn’t terribly interested in a third trip. Don’t get me wrong, it’s a beautiful place, but I’ve already captured some nice shots from there. I’m sure there are some compositions I could try, but my goal on this trip is to capture reflected light shots in the nearby canyons. Below is a photo I shot at the Wave in early 2009. It was taken on Velvia 50 with my 4×5 camera. The ranger arrived, opened the gate, and led a caravan of vehicles into the dirt parking lot. All I needed to do was check the weather report. The door opened, and 38 people filed into the small building. The ranger pinned an updated weather report to the small bulletin board. The forecast called for partially cloudy skies today, increasing clouds tomorrow, and a 30% chance of rain on Sunday. I was unsure if I should spend more time back in Buckskin. Even without a threat of rain, clouds will absolutely kill reflected light. Though I didn’t find anything along the Paria River yesterday, I only explored part of the canyon. Perhaps I could spend the rest of the day hiking further into the canyon. The ranger handed me an application for the wave lottery. I wasn’t there for the wave lottery, but I filled it out anyway. With 38 people present, and only 10 hiking permits available, I didn’t stand a chance. Each application was assigned a number. I was number 7. The ranger placed a bingo ball tumbler on counter, and filled it with small wooden balls — one for each lottery participant. With much anticipation, the lottery was underway. People came from all over the world just to stand in this small room and take their chance with the wave lottery. The ranger cranked the handle, and the balls tumbled to life. She let them settle, then opened the cage and retrieved the first ball. Number 8 was read, and a permit was issued to a couple in the back of the room. Now, just 8 spots remained. The balls were cranked further, and another number was selected: 17. This permit was issued to yet another couple. The maximum group size allowed is 6 people. If the next number called was for a group this large, the lottery would be complete. A number was called, and the permit was issued to a solo hiker in his 20’s named Thaddius. A big smile appeared on his face. The next permit was issued to a couple standing to my right. They too were delighted to be chosen. 3 spots remained. There were many groups in the room that consisted of 3 or more people. If a group of 4 was chosen, they would have a decision to make — leave someone behind, or forfeit the permit to a smaller party. The next number was called — another couple was chosen. It was down to one spot, and there were very few solo hikers in the room. The room was alive with energy. Silence fell over the room as the final number was pulled from the wire cage. Sweet! I now had a plan! On my two previous visits to the Wave, I was stricken with blue skies. I was excited by the prospect of photographing the wave with beautiful clouds in the sky. The crowd dispersed, leaving just the 10 of us to collect our permits. The other solo hiker, Thaddius was quite the character. After losing his job to the bad economy, he had a new job lined up in the fall. This gave him several months for a whirl wind trip of backpacking through both the Southwest and the Sierra Nevada in California. After telling him about my plans to relocate my camp back to Stateline, he asked if I was interested in through-hiking Buckskin Gulch today. Though it would have been fun, I declined. My goal was to scout the canyon rim just east of the confluence of Buckskin Gulch and Wire Pass. Since the Buckskin Gulch trailhead was on my way back to Stateline Campground, I offered to shuttle him there for his ambitious dayhike. At 11AM, I dropped Thaddius off at the trailhead. It was a very late start, but he was use to covering a lot of ground in a short period of time. He was training for 20+ mile days while backpacking in the Sierra Nevada. I wished him luck, then continued back to Stateline campground. I reclaimed the same site from earlier in the trip, loaded some film holders, then set out to scout the area on the other side of Buckskin Gulch. I descended into the canyon, then followed it upstream. I scaled a sandstone ledge, and climbed above the confines of the canyon. I crossed a sandy plateau, then hiked to the foot of a sandstone escarpment. This is an area I had been curious about for some time. As the afternoon progressed, beautiful clouds streamed across the sky. I stared across the valley, my eyes fixed on the location of the wave. The people at the wave today were lucky — the conditions were perfect. I crossed my fingers, and hoped for similar conditions tomorrow. 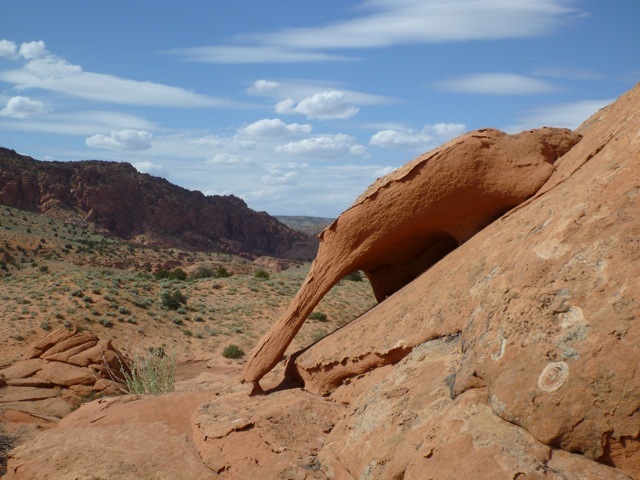 This entry was posted on July 24, 2011 at 9:59 pm and is filed under Colorado Plateau, June 2011, Photo Trips, Photography. You can follow any responses to this entry through the RSS 2.0 feed. You can leave a response, or trackback from your own site. Ben, Ribbons of Gold is gorgeous! Makes me want to win one of those lottery spots even more. What causes those grooves? was it the ice age or the way the lava came out? Beautiful how nature can make rocks look so beautiful. 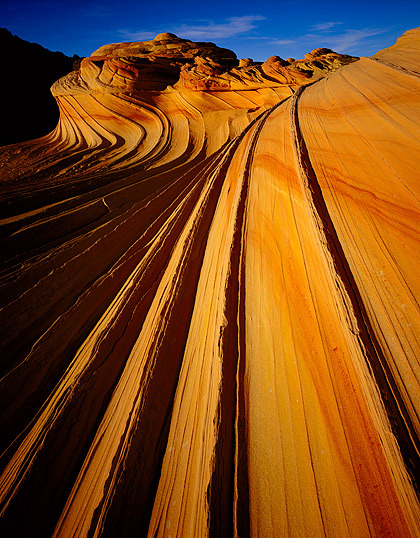 The grooves are the remains of 40 million year old sand dunes. No lava in the wave area, but you can find it a few miles up on Highway 89. You can also find triops, living fossils that haven’t changed in 70 million years, living in the water pockets around the wave. Damn that’s a cool area!